There was a time when people thought of knitting as something that grandma did. It was a clever craft that did not seem very relevant. This is no longer the case. Knitting is trendy; you often see people choosing to knit on their daily commute and knitting groups are springing up around us. The fact is that knitting is a great way to relax and it gives you the opportunity to create cool clothing and accessories. One of the most important things to remember is that learning to knit is not a race. You should take your time and make sure that you get it right, rather than try to rush ahead. There are lots of amazing knitting patterns out there, but do not try anything too complicated until you are ready. There are other things that it’s useful to know when you are learning to knit; here are some of the most common questions that novice knitters ask. If you know someone who is willing to give you one on one tuition this can be a great way to learn to knit. However, make sure you choose someone who has the patience to deal with any difficulties you may have. There are also plenty of knitting tutorials online that you can use. You may find it useful to supplement this type of learning by finding a knitting group in your neighbourhood. Doing so means that you can share the experience of learning, with others. Stitch counters so that you can keep track of the number of stitches you have knitted. Point protectors which serve to protect the points of knitting needles and stop stitches from falling off when you put your knitting away. Crochet hooks to rescue dropped stitches. Of course, you can learn to crochet too. Yarn needles which can be used to finish off ends or join seams together. What should you knit first? 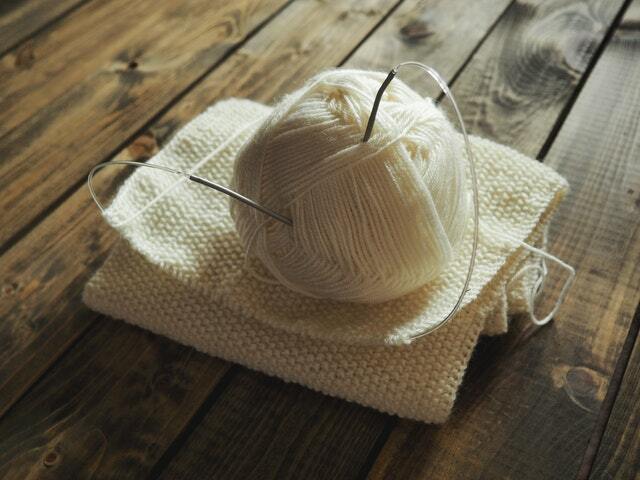 It’s a good idea to learn to knit by producing something basic, like a simple square of knitting. This gets you used to using the needles and creating stitches. Then you can try creating something simple like a scarf, before moving on to more complex patterns. Once you start to learn, you should be able to knit a few basic stitches within the first couple of days. They may not be as even as they should be but it’s a start. You should be able to achieve more consistent results in about two weeks; assuming that you knit for around one hour each day. Do not worry if you make slower progress than this as the most important thing is to get the stitches right. Which knitting style should you use? The two main styles of knitting are English and Continental. You may want to try them both and opt for the style which works best for you. The styles differ in the way the knitting yarn is wrapped around the right needle before the knitter pulls it through to create the stitch. The yarn is thrown in English style and picked when Continental style is used. Never forget that knitting should be a relaxing and enjoyable pastime. Take your time to learn and do not become stressed or anxious when you make a mistake; just try again until you get it right.